You simply cannot remember WWII without thinking about the jeep. Willys and Ford both made jeeps for the war effort. Every theatre of combat had jeeps in it! We gave jeeps to allied countries and left them behind after the war. 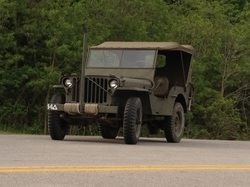 WWII jeeps are still running today!